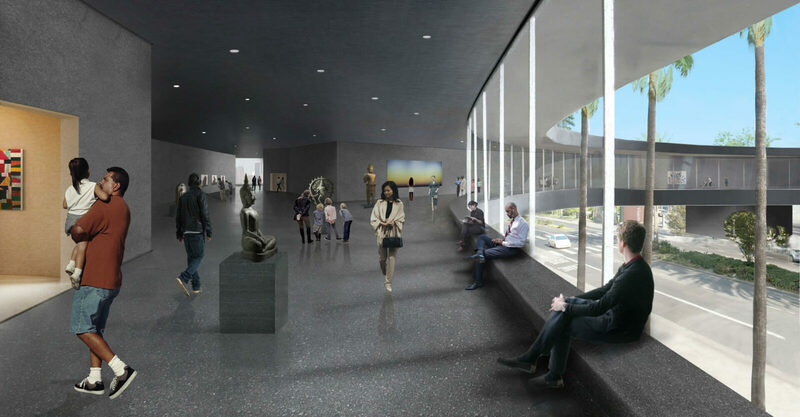 Perhaps the word “controversial” is an understatement to describe LACMA’s reconstruction plans over the next decade. The museum Director, Michael Govan, has planned to demolish most of the museum to make way for a new building designed by renowned Swiss architect Peter Zumthor. Zumthor is a critical darling of the architectural world. Architects across the globe admire his projects for his attention to detail, materials, texture, lighting, and emotional intensity. His designs for LACMA, however, are potentially out of scale and a gargantuan $600 million financial boondoggle for the museum and the county. Govan sat down for an intimate discussion with members of the AIA to recruit Architects as advocates for the reconstruction. Once I understood the reasons behind many of the design decisions, I am comfortable defending much of the intent of the design team. Below are the main points of contention, and how I would reply to these concerns while evoking the spirit of Govan and the LACMA Board. Govan believes that the best museums – small medium or large – are best experienced without vertical circulation. Part of this is a concern to minimize visitor interruptions, as Govan expressed his aversion to elevators at least 3 times. The other part of the concern is to provide a layout devoid of hierarchy, reflecting Govan’s sincere intent to provide a landscape of equity for the cultural representation of art and artifcat. Govan notes that encyclopaedic museums – of which LACMA is one, such as the Met or the Louvre – typically suffer from poor placement of certain cultures. The odd shape is a result, or even a default, after trying for years to implement more regular shapes. According to Govan’s anecdote, each time Zumthor had a rectangular design, it typically created too much of an experiential hierarchy and/or ran into problems with direct context. There are active excavations ongoing at the tar pits, and a host of adjacency constraints. Once the buildable site perimeter was developed – set by the county – and other surface constraints were taken into consideration, the blob was formed. There are generally two types of museums: (1) ones with fixed spaces for art where walls don’t move, forcing curators to adapt; and (2) expansive open footprint museums which allow curators to invent their gallery spaces and subdivide as necessary. LACMA already has the latter warehouse type in their contemporary art museum building and special exhibits pavilion, both slated to remain during and after construction. Govan, however, seemed to have a particular aversion to the resulting “drywall” types of spaces. 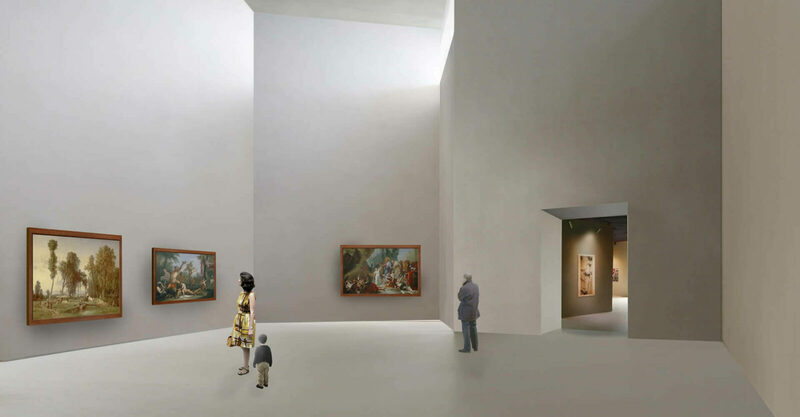 He prefers to create a fixed gallery infrastructure for the new building, proposing in the new design that there be 7 or 8 designated zones for exhibits, each designed with slightly different characteristics to accommodate different types of displays. The benefits of a fixed gallery infrastructure also include a reduction of resources (not building and demolishing walls) and a reduction in exhibit down time (expediting the transition between exhibits). Govan added that curators are similar to other creative professionals, where constraints can be the mother of invention. Govan believes the new design, in conjunction with existing resources, provides the greatest flexibility and efficiency. As a gesture to the county (?) Govan was willing to place a good percentage of floor area on the lot they own south of the main museum to impede less into the county park and tar pits areas. Expecting large crowds to enjoy the enlarged public spaces is important too, as the timing of the new building is aligned with the metro station opening at Fairfax. 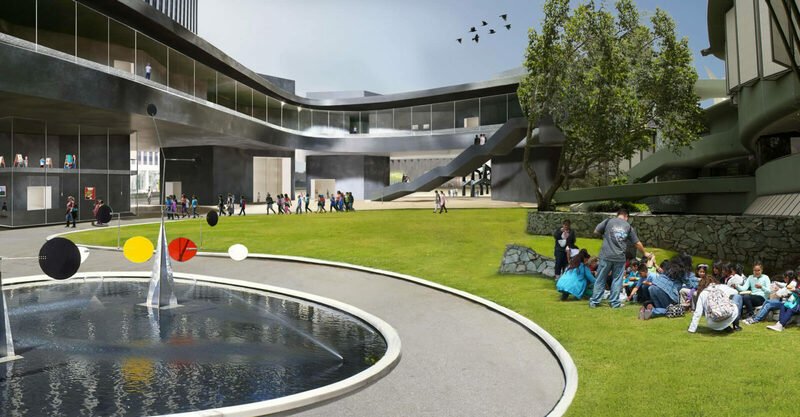 The combination of the aforementioned intent for single-story circulation and the constraints of the adjacent tar pits and county park, the museum must be lifted above the ground. Of the major design solutions, this one is the most difficult for me to accept. I believe resiliency of a building’s design to encounter changes in program over time is an integral element to provide, as real as bathrooms. Good architects can anticipate the future and integrate that analysis into their designs. The proposed LACMA, however, is a singular idea with an unexpandable shape. Govan does imagine a few possibilities for future expansion, though none of which he is explicitly designing the new museum to incorporate. (1) Continue the idea of a campus, where new pavilions can be added. 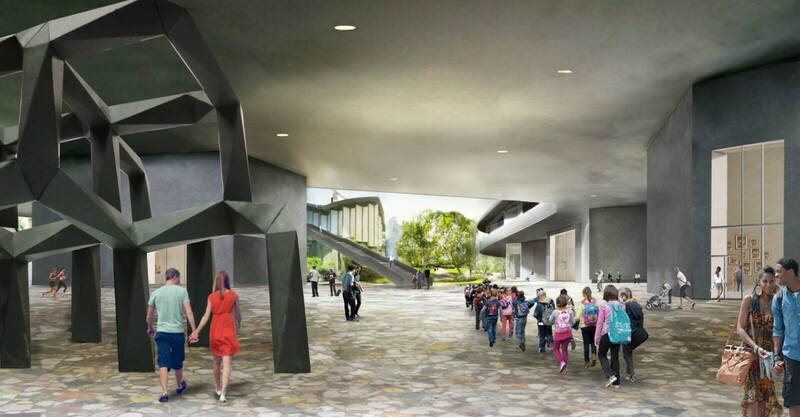 After all, even after the proposed building is finished, there will still be three additional structures left as part of the museum: the japanese pavilion, special exhibits, and contemporary art. . . not to mention the tar pits museum, the Petersen, and the forthcoming academy museum all in view. Govan has already begun the process of purchasing surrounding land, and seems keenly interested in the land south of their lot on Wilshire. Oddly, he also imagines expansion into Park La Brea, the post-war housing enclave just to the north of the site. (2) More probably, he envisions a diaspora type of art institution – especially as a county museum – where exhibits can utilize a distributed model more in parallel to LA’s own nodal urban planning. I don’t think was brought up in the conversation. . . .
LACMA has chosen to go with solar panels, perhaps achieving net zero for most operational days.